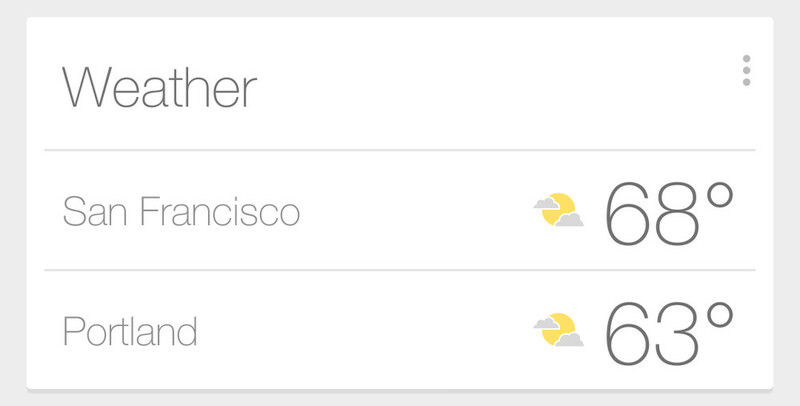 The Google Now weather card received an update last week to a more simplified, multi-city appearance. We had at least one reader send it over, but it wasn’t until today that the card started to rollout to everyone. So yes, you should see it, assuming you have travel plans in the near future. The card typically shows the weather for the city you are in. In fact, it still does. But should you travel or have plans to travel to a new city, it now shows multiple cities stacked into a single card. In the past, Google Now would stack multiple cards on top of each other that could be toggled between. I actually preferred the multi-card approach, but hey, I’m not an app designer. Cheers Chris, Anthony, and me!